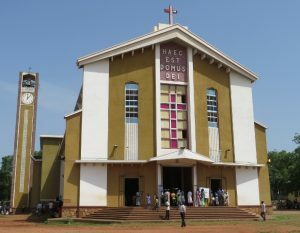 The Comboni Missionaries in Juba, South Sudan, joined the congregation of St. Theresa Cathedral in the country’s capital city, on the feast of Pentecost, to mark the 150th anniversary of the foundation of the Comboni Missionary Institute for Africa, which was founded by St. Daniel Comboni on 1 June 1867. 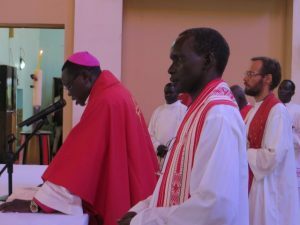 The Auxiliary Bishop of the Archdiocese of Juba, Santo Loku Pio, presided over the Eucharist. A good number of priests, religious and lay faithful joined the celebration. During the celebration of the feast of Pentecost, Bishop Santo Loku Pio put in evidence the role of the Holy Spirit in the life of the Church and in our own personal life, as well as the role of the Holy Spirit in the life of the Comboni Missionaries. “I emphasized that the life of a missionary is a life of dedication and risk, since missionaries are going normally to proclaim the Gospel to the most risky and challenging places in order to give a real service to the people in various sectors of life like schools, clinics, dispensaries, hospitals and parishes” said Bishop Santo. He also acknowledged that ‘missionaries are always ready to sacrifice themselves for the good of people, sharing in their sufferings without abandoning them in the most difficult situations’. In fact, among the Comboni Missionaries we can find many martyrs who gave their lives for Christ and for their people and were faithful to the Gospel until the very end, thus becoming a great example for all of us. The Auxiliary Bishop went on and talked about the role of South Sudanese Christians. He acknowledged that, many times, there is no real spirit of service to people because of fear of witnessing their faith and the incapacity of recognizing the gifts of the Holy Spirit in their midst. The Prelate invited families and the entire community, and even the government, to take up their roles seriously. He emphasized particularly that our present situation of hunger, corruption, division and lack of respect for human rights is blocking the work of the Holy Spirit in our lives and in the life of our country. 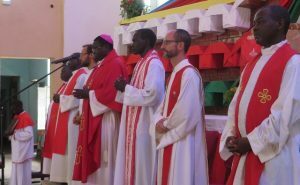 Bishop Santo invited the assembly to imitate the example of the Comboni Missionaries in their 150 years of dedication to the people of Sudan and South Sudan and to pray for them and for more vocations to missionary and religious life. He concluded with a word of appreciation to the Comboni Missionaries and recalled the example of his former parish priest, Fr. Michael Barton. “If I am a Priest and Bishop here and now is because of the work of the Comboni Missionaries”, he added. On behalf of Fr Louis Okot, Provincial Superior, and all the Comboni Missionaries, I am honoured to thank you for attending this Eucharistic celebration on the Solemnity of Pentecost and pray for our missionary institute and all missionaries so that, as we are prompted by the Holy Spirit and the love of Christ, the Church might continue the work of Evangelization: the world and our country – South Sudan – are still longing for the light of the Gospel. We are grateful to God for having inspired St Daniel Comboni to take at heart the evangelization of Africa. In the year 1864 he conceived a comprehensive plan for THE REGENERATION OF AFRICA by recognizing the dignity and gifts God has given to the people of this continent. Then, in the year 1867, at the age of 36, he founded in Verona (Italy) the INSTITUTE FOR THE AFRICAN MISSION. It was his contribution to bring that plan to fulfilment. At its beginning, the Institute for the African Mission was quite different from the Institute of the Comboni Missionaries as we see it now. Since the beginning, the Institute had to rediscover itself in front of the great challenges of the mission in Africa and had to do it continuously during these 150 years of existence. A former superior general – Fr. Federico Vianello – in a letter to the confreres tried to explain these passages as part and parcel of the very nature of the institute: he said that the institute was “of lowly birth” and had “a tempestuous infancy”. He referred to the fact that, though the Institute was the fruit of a great vision for Africa and had the support of PROPAGANDA FIDE and the Bishop of Verona, Comboni found himself alone with few collaborators in front of a huge and difficult mission. Moreover, Comboni and his successors had to suffer much to put good foundation to the African mission… and did so because they were prompted by God. At the very beginning Fr. 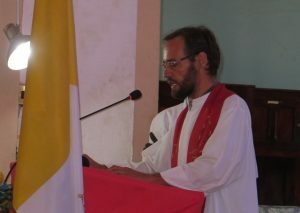 Daniel Comboni was speaking of the Institute as “a free secular association of Clerics (from different dioceses and religious orders) and lay-men (coadjutor brothers) that consecrate their works and, if necessary, their lives, for the conversion of Africa”. The first rules arrived few years after the foundation: a first draft in the year 1871, and the second one in the year 1872. In the preface Comboni specified that: “In order to be of lasting value, the Rules of the Institute must be based on general principles” because the focus is not on the duties – as in the religious orders – but on the mission itself and the demands of the mission. Then, in 1885, the situation of the mission – with the Mahdi Revolution in the Sudan – and the Church – Propaganda Fide – demanded that the Institute would be transformed into a religious congregation with vows – for priests and brothers – to guarantee an institution with more stability. The process lasted up to 1895 under the guidance of the Jesuits. The name of the Institute became Institute of the Sons of the Sacred Heart of Jesus. Only after the separation of the Italian-speaking branch and the German-speaking branch in the year 1923, and later the re-unification in the year 1979, the Institute took up the name of Comboni Missionaries of the Heart of Jesus. The Institute went through both many joyful and sad events, great breakthrough in the mission and exemplary witness of dedication but also periods of limitations, weaknesses and mistakes… but, looking back, we see an Institute that never run away from its duty and mission. Among the saddest events for the Institute was the expulsion of all foreign missionaries from South Sudan back in the year 1964. Later, we had a similar experience in Juba when the missionaries were asked to leave the city in the year 1992, though some South Sudanese confreres could stay up to the year 1994. Anyway, today, God blessed and renewed our Institute – even out of the events of this past history – and strengthened it with his Grace. Therefore, we celebrate this anniversary with gratitude to the Lord for his mercy and compassion for Africa and for his Spirit who lead the Church to finally gain this “precious black pearl/Africa” as it was called by St Daniel Comboni. And I personally see that the Institute has still a mission ahead at the service of the Universal Church on the field of first evangelization (in Africa and in the world). To conclude, we also give thanks to the Lord for the beginning of the new formative year and the vocation of these 15 youth that are here present and are starting today their vocational and missionary journey in our house of pre-postulancy named after Fr Barnaba Deng (I say to the pre-postulants: Please, stand!). I must also mention that when Fr. Daniel Comboni founded the male Institute (1867), he had already in mind the female Institute that was established later in the year 1872. They were called the ‘Devout Mothers of Africa’ and now they are known as the Comboni Missionary Sisters. During these century and half of missionary life we have shared at the same spiritual source and worked hand in hand in the missions. St Therese Cathedral (Juba), 4th June 2017.